NSW Waratahs captain Bernard Foley has spearheaded a remarkable comeback as his side overturned a 17-point halftime deficit and beat the Highlanders 30-23 in their Super Rugby quarter-final. The Waratahs host the Highlanders on Saturday night at Allianz Stadium, Sydney in the Super Rugby quarter-finals. Join The Roar for live scores and a blog of the match, starting from 8:05pm (AEST). This is the first time the Waratahs have reached the eliminations rounds since 2015, which was when Michael Cheika moved on to coach the Walalabies on a full-time basis. Consequently, from Darryl Gibson’s takeover, the ‘Tahs have had a drastic fall from grace, failing to qualify in 2016. Last year, they finished a disgraceful third from the bottom, only above the Sunwolves and the Kings. But 2018 is a different story. 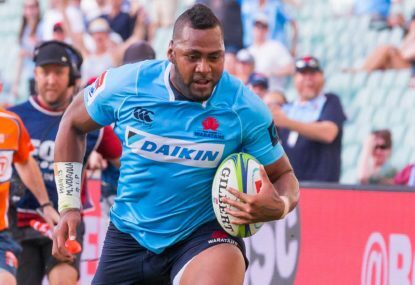 Despite a 29-0 trashing by the Lions, the Waratahs have displayed an effective attacking approach that enables them to reach opposing redzone. Their set-piece has been reliable. Their defence has been solid – until recently while captain Michael Hooper has been injured. Without a doubt, the Highlanders will take full advantage of this. They will be out for revenge after being trashed by the Waratahs. Firsly, they are keeping the red carded Tevita Nabura away from the Waratahs, including and especially Cameron Clark. Another Tevita, Tevita Li, will be man the left wing. Last week, he broke through four defenders, ran 90 metres and scored a try. He will probably do this again, if not more, by attacking the less experienced Alex Newsome. On paper, the Highlanders back row, halves and reserves are deadlier than the Waratahs. Their speed, strength and experience are a key difference between the two teams. But it was a similar situation three months ago, and the New South Welshmen outplayed the Highlanders to win by 30 points. This is going to be a great game. These two teams who have opposing styles which should give the Waratahs a lot of possession. If the Waratahs defence and set-piece reverts to type, it’s their game. But their consistency in these areas over the past few weeks have been poor. Nevertheless, the Waratahs will throw everything into this match, as a point of pride. I think, again, they will win despite the odds against them. Join The Roar for our live blog of the match, starting at 8:05pm (AEST).